Home » Entertainment » Falz Files Court Papers Challenging The Ban Placed On His Song "This Is Nigeria"
Falz Files Court Papers Challenging The Ban Placed On His Song "This Is Nigeria"
Folarin Falana, popularly known as Falz, has filed papers in court challenging the ban placed by the National Broadcasting Commission (NBC) on his song, "This is Nigeria". The court documents were filed through Falz's lawyers, Adepetun Caxton-Martins Agbor & Segun (ACAS-Law), on November, 6, 2018, three months after the NBC sent a letter to JODAJ Global Communications Limited in Jos sanctioning them for playing Falz's song, "This Is Nigeria" and banning the song from being played on radio, along with other songs. 1. 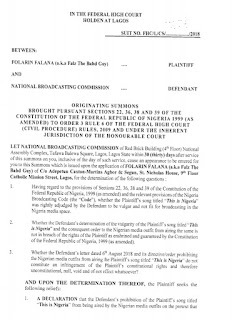 A declaration that the Defendant’s prohibition of the Plaintiff’s song titled "This Is Nigeria" from being aired by the Nigerian media outfits on the pretext that same is laced with vulgar lyrics is in flagrant breach of the Plaintiff’s right to the freedom of thought, conscience and expression as guaranteed under Sections 38 and 39 of the Constitution of the Federal Republic of Nigeria, 1999 (as amended) and to that extent, such prohibition is unconstitutional, null and void. 2. 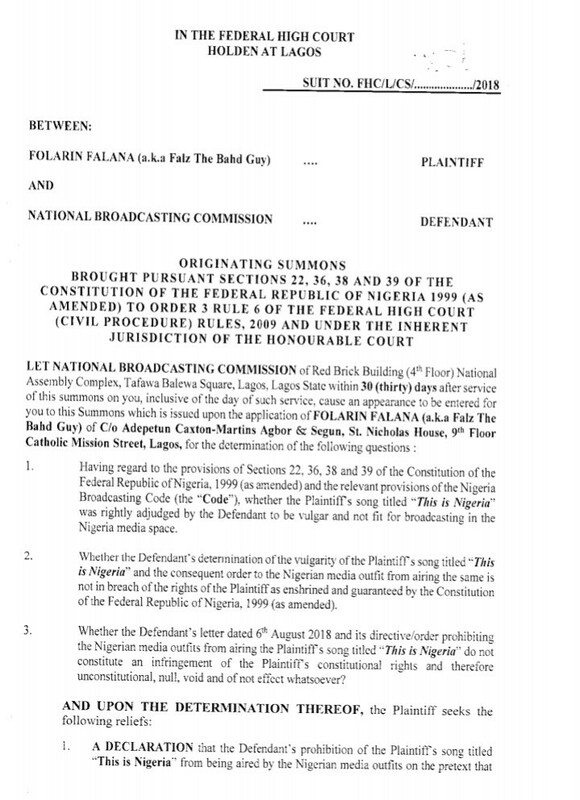 An Order of this Honourable Court setting aside and/or vacating the decision of the Defendant as contained in the letter dated 6th August 2018 and lifting the ban or proscription of the use of the Plaintiff’s song titled, "This Is Nigeria" by any and all Nigerian media outfit/organizations.